We seldom can read about the life, experiences, and dreams of a common citizen, but here is a glimpse of American society of the late nineteenth century “from the bottom up” as revealed in the life of one man and his family. History is often written about the rich, famous, powerful, and those at the top of society. We seldom can read about the life, experiences, and dreams of a common citizen, but here is a glimpse of American society of the late nineteenth century “from the bottom up” as revealed in the life of one man and his family. 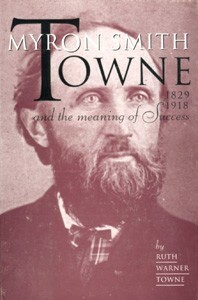 Myron Smith Towne, who came from Pennsylvania and fought with the Union in the Civil War, sought his fortune by going west, only to encounter hard times, disappointment, and finally success in a small northern Missouri town. Meet the many interesting personalities portrayed here for insight into late nineteenth-century America. Dr. Ruth Warner Towne, Professor Emeritus of History, Dean of Graduate Studies Emeritus, Truman State University. She received the baccalaureate degree from the same school which was then Northeast Missouri State Teachers College, the Master of Arts and Ph.D, both in history from the University of Missouri in Columbia. She taught at the same school under its various names from 1952 to 1993. She is author of A Winner Never Quits: The Life of Walter Harrington Ryle, 1970; Senator William J. Stone and the Politics of Compromise, 1979; From These Beginnings: A History of the First United Methodist Church, Kirksville, Missouri, 1984; and articles for the Missouri Historical Review; the Encyclopedia Americana annual Update; and the Encyclopedia of World War I.